Joseph Lehane Voelker, age 89, of Casper, passed away March 22, 2019 at Wyoming Medical Center. 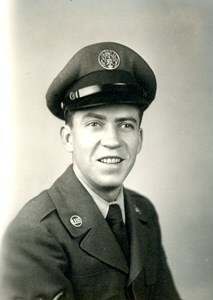 Joe was born on June 17, 1929 in Denver, Colorado to Joseph Voelker and Lola Comstock. Joe was adopted by Christian and Elsie (Hall) Voelker. Joe served in the military for more than 29 years. Joe retired from Coliseum Motors in 1991, as an automotive mechanic after many years of service. Joe enjoyed playing the organ and several other instruments. Joe was an avid camper and fisherman. Joe had a wonderful sense of humor and was a master teller of tales. Joe was preceded in death by his parents, daughter, Deni Lee Voelker, and his siblings. He is survived by his loving wife of 43 years, Virginia "Jenny" Voelker, Daughter, Teri Voelker, Daughter, Tami Voelker, Son, Tony (Kim) Voelker, Daughter, Tina (Tim) Rudderow, step-daughter, Deanna (Ron)Aylor, step-son, Mark Brumley, 16 Grandchildren,18 Great-grandchildren, and numerous nieces and nephews. A Celebration of Life with Military Honors will be held at 11:00am, Wednesday, March 27, 2019 at Oregon Trail State Veteran's Cemetery in Evansville, Wyoming. Memorial contributions may be made to a charity of the donor's choice in Joe's memory. Add your memories to the guest book of Joseph Voelker. So sorry to hear about your Dad, TJ and saddened with the thought of your loss. Prayers of comfort to you and your family. I didn’t know Joe well but I know his home was a good and safe place to visit; a home where love lived and I felt wanted and welcomed. I remember him as a quiet behind the scenes man. I see his children as good and precious gems and as great tributes to his legacy. Im honored to join in your grieving process as you share your priceless and heartfelt memories. I pray that our glorious and holy Father will lift your hearts and spirits each day. For the angels are now singing and praising at the heavenly reception that has been prepared especially for your beloved Joe Voelker.